This past week, March 20th – 27th, has been one of the more normal weeks that Kara and I have had in while. Of course, that’s hardly saying something when you are living in another country. This week Kara and I had to put the axe to the grind, so to speak, and make a dent in a steadily rising pile of upcoming assignments. What’s more, Spring Break is coming up soon for us, and there is plenty yet to be done in preparation for our trip to Germany. Still the busy week did not stop Kara and I from going on a few new adventures. On Wednesday Kara and I took our weekly trip with Jimmy and Helen to Castle Campbell, also known as Gloume Castle. The Castle, built by the Duke of Argyll of Clan Campbell, is situated on the top of a mountain of volcanic rock above the city of Dollar. At some point the brittle cliffside split and a small segment of the courtyard drifted to the side some ten feet. According to some of the few known records concerning the life in Castle Campbell, John Knox visited this castle at some point during his ministry in Scotland. Allegedly, Knox gave a sermon from the fractured piece of the courtyard to a congregation gathered below. To this day that fractured piece of the courtyard is called John Knox’s Pulpit. The attendant and caretaker of the Castle (who was a really nice guy named Finley), however, told us that he doubts that Knox ever preached such a sermon. Still, the name sticks. Fast forward a few days and we get to Friday where Kids Club went excellently. We had a new visitor this week: a boy named Connel (I hope that’s how he spells it) who a few of the kids knew from school. After an impromptu game of… well I’m not sure what to call it… ultimate frisbee/soccer/football/roughhousing we recited our memory verse: Romans 3:23 “For all have sinned and fall short of the glory of God.” Shortly after that I presented the lesson on the Creation and fall of man from Genesis 2-3. I am pleased to report that the lesson went quite long as the kids had many engaging questions to ask. Even after kids club was over Connel came up to me and asked me about how all the animals were made and some of the boys and I explained the six days of creation. After Kids Club the older kids stayed and a bouncy castle was set up in the gym for CY. Pandemonium ensued. On Saturday Beth, Fraser and Stacy Rider, Kara, Milo the Dog, and I went on a trip to the Highlands and saw some fantastic snow capped mountains. Despite catching a slight cold and cutting my knuckle open on a road sign this was one of if not my favourite adventure to date. 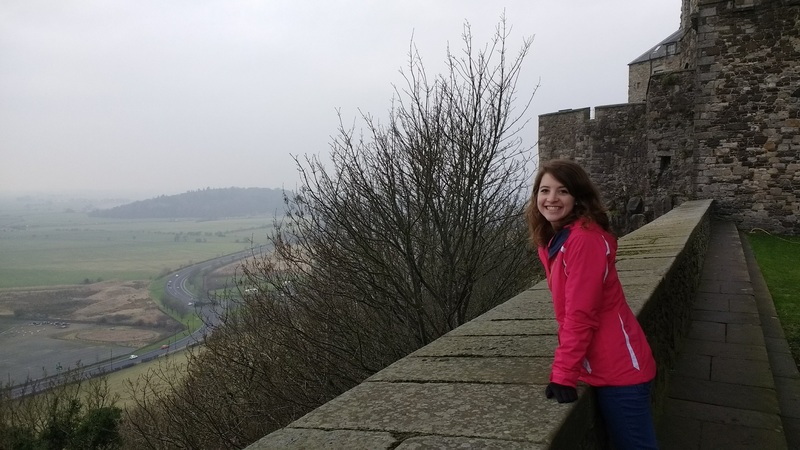 We saw many scenic overlooks, skipped rocks, made up games by throwing rocks, forded a stream, climbed the walls of a castle, and ate some of the most delicious food you could imagine at Beth’s favourite Chippie. Sunday was another day of adventure. Kara and I visited a church in Glasgow of which our Systematic Theology professor, Kenneth Stewart, is the pastor. Pastor Stewart gave a lovely sermon on Ruth in the morning service and one of Samson in the evening. Between the services Kara and I ate lunch at Pastor Stewart’s home and visited with some friends we had made from Glasgow University during the filming of the Semester in Scotland promotional video. One of those said friends, Ian, gave us a lift home to Airdrie, and Kara and I, despite our best efforts to write a bit more on our papers, decided it best to call it a night. Kara and I appreciate all your prayers back home and all the kindly hospitality we have experienced here in Scotland. Please continue to pray that the Lord would give us all contentment with his good and perfect will and that we would trust in him as our rock and our redeemer. Thanks! The highlight of this past week for me was definitely Kid’s Club and CY (Covenant Youth) on Friday night. The kids had so much energy at Kid’s Club (which wasn’t new), and they really directed that energy toward interacting during the lesson on Creation and in doing their craft. We decorated flower pots that night by using thumb and finger prints to make insects, and each kid filled their flower pot with soil and flower seeds. I pray that in the same way that these kids nurture their flower seeds to grow, God would nurture the seed of the Gospel in their hearts and bring them to salvation in His Son. At CY that night we had a craft night (perhaps why I enjoyed both so much—I love crafts!) which was a blessing not only because of the time spent making picture frames and festoons, but mostly because of the time spent talking, laughing, and goofing around with other friends and Christians. Some of the finished products of CY Craft Night. I guess you could say that just like this great night spent with people was the highlight of my week, spending time with the people here has been the highlight of my semester thus far. God has been teaching me so much through my time spent in Sunday worship, Wednesday outings, weekly Bible studies, Kid’s Club and CY, meals with church members, and the other spontaneous events like game nights, movie nights, Saturday adventures…even just walking home with people and chatting. That’s not to say that every time I’m in one of these situations I am acutely aware of some specific lesson from God or even that He’s teaching me at all; rather, it is the culmination of time spent with God’s people and in His Word that are opening up avenues for God to penetrate me and grow me to be more like His Son. Often times I am not aware of this as it happens, but upon looking back I can see that there have been changes in my attitude and character over the past couple months. I pray that upon my return to Pennsylvania I will continue to immerse myself in the things of God and allow Him to continue to work in me, as He has been doing ever since my conversion. As I said, this has been the highlight of my time here, but it goes without saying that my time here neither has been nor will continue to be without struggles! If you would, please continue to keep Ethan and I in your prayers. God bless! One of our stops on our Saturday Adventure with Beth: Loch Tay! Also on our Saturday Adventure: a wild Ethan troll under the bridge at the Falls of Dochart. Walking up the stairs from the underground onto Old Street in London was a pretty exciting moment for me! It was like that scene in Enchanted when Giselle pops up out of the manhole and stares around with an open mouth at the new world that she’s in. Minus the fact that I was not standing in the middle of the road in a ball gown, and it was also not New York City. I did do one of those classic slow spins though to take in my surroundings—the old buildings, the red double-decker buses, a couple big billboards, and some very strange outfits. Beth, and Ethan, and I walked to a cemetery a couple blocks away where we saw the graves of Daniel Defoe, John Bunyan, and others, and which was across the street from the church and manse of John Wesley. Feeding the birds: not at St. Paul’s, but at the cemetery where John Bunyan is buried. After settling into the apartment we’d be in for the week (super nice, by the way! ), we took the bus to the Museum of London and looked around one part of it before we were kicked out at closing. (That’s pretty much a regular occurrence at museums for us.) We headed off walking towards the River Thames and to see the sights along it and to take the river bus back up. The first place we saw as we neared the river was St. Paul’s Cathedral, and let me tell you, it looks SO amazing at nighttime. The enormity of it seemed to be amplified and the lights made the white exterior glow. I think what really sealed it though was that it reminded me that much more of what it looks like in Mary Poppins, which contributed to the eeriness and the grandeur of it. It was so, so cool. (And yes, Beth and I were humming “Feed the Birds” for probably an hour after that.) We crossed Millennium Bridge which was lit with multi-colored lights and walked on the opposite side of the river from where we could see some famous buildings towering over the shore on the other side. Our walk across Millennium Bridge. Looking back from Millennium Bridge at St. Paul’s. Once we were back on the other side though, we boarded the river bus near the Tower of London and sailed up the river, from which we caught our first glimpse of Big Ben and Westminster Abbey. After travelling by car, plane, train, underground, bus, and boat that day, we were amply prepared for some rest, and we headed home for the evening, Day 1 being an absolutely brilliant success. Early on Tuesday Kara, Beth, and I got up and rushed through the many public transport stations in a sea of business professional clad men and women towards our first destination for the day: Parliament. We emerged from the underground and were met by the monolithic tower of Big Ben and the beautiful and ornate stonework of the Palace of Westminster. Outside the Houses of Parliament in Westminster. Upon entering parliament, we began a guided tour of the House of Commons and a small part of the House of Lords. We all marveled at the vast, vaulted stone ceilings, the delicately carved images and statues, and the paintings of past members of Parliament and Monarchs. Our tour guide explained to us the different uses of the many rooms, the roles of different staff, and the relationship the Parliament has with the current Monarch, Queen Elizabeth II. Fun Fact: Due to the rash actions of King Charles I in 1642 A.D. no English Monarch is allowed to enter the House of Commons. Thus, Kara and I saw a part of London that not even the queen herself has ever seen! After completing our tour and briefly meeting the Parliamentary representative of Airdrie, we ventured over to Westminster Abbey just across the road. Kara and I wandered the Abbey together with a guided audio tour that pointed out several incredible and inconspicuous details of the building. Kara and I saw the graves of Sir Isaac Newton, Charles Darwin, George Frederick Handel, Geoffrey Chaucer, Charles Dickens, Rudyard Kipling, William Thomson (Lord Kelvin), David Livingston, and numerous Monarchs. After leaving the Abbey and breaking for lunch we all hopped on one of those quintessential double-decker London buses and rode to the British Museum. There we saw a swath of ancient historical artifacts such as ancient Persian and Egyptian sphinxes, tablets engraved with the names of Babylonian kings, figures from the Greek Parthenon, and the Rosetta Stone. There were so many amazing pieces of history in the British Museum I am convinced it would take weeks to take note of everything. After the British Museum Kara, Beth, and I went to our final stop of the day and my favorite place in London: The British Library. Here we were able to see writings from Michelangelo, Galileo, Winston Churchill, Henry VIII, and more. We saw sheet music from Bach, Beethoven, Stravinsky, and even the original drafts of Handel’s Messiah and Ticket to Ride by John Lennon. We saw the original copies of the Magna Carta, Beowulf, and the Tyndale Bible as well as numerous beautiful eastern religious scrolls and books. The book that I found to be the most incredible, however, was the 4th century Codex Sinaiticus: the earliest complete Christian Bible ever found! This book, unlike all other historical artifacts I’ve ever seen, is absolutely priceless. It is truly an incredible feeling to gaze upon those animal hide pages that took centuries of perseverance through Roman persecution to write. Not amazed yet? Let me put it to you this way: every Bible that we have today — ESV, NIV, KJV, what have you — every Bible, uses this book as a starting point. Truly incredible. In Oxford. Like I said, ultimate tourists. 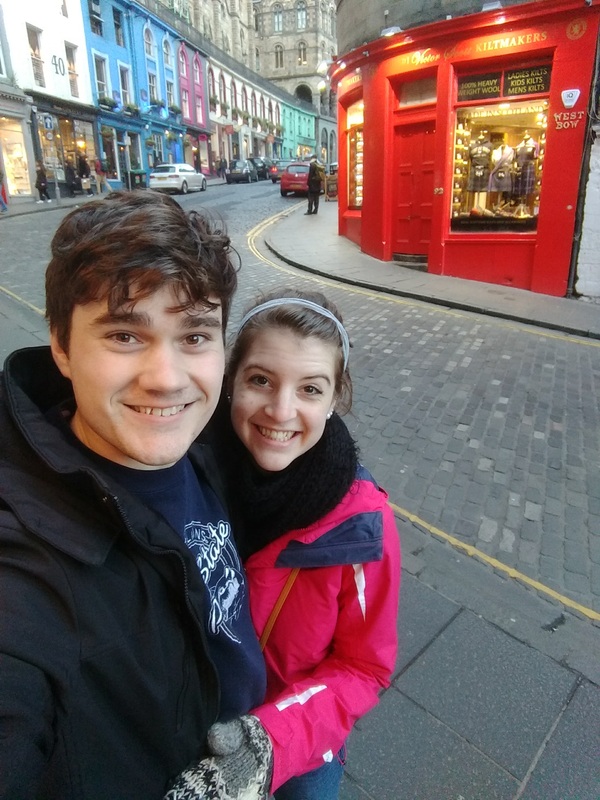 On the way, we saw some of the 38 colleges that make up Oxford University as well as many shops, monuments, and pretty trees that were beginning to show signs of spring. God really gave us a beautiful day for our trip. As a result of the many colleges in the town that have been built over centuries, the architecture styles are vast, and one of the streets in Oxford is actually considered one of “the most architecturally diverse” streets in the world. After riding the bus for a full circuit, we did hop off and explore some of the city, stopping first at the sweet shop that Lewis Carroll mentioned Alice visiting in his book Alice in Wonderland and then taking a tour of Christ Church College (where they filmed some of the Hogwarts scenes in the Harry Potter films). Beth and I inside Christ Church College. We also took a tour of the Bodleian Library, which has over TWELVE MILLION ITEMS in it. It receives a copy of every book published in the United Kingdom and, as such, has a separate warehouse used to store most of the books. The day ended on an especially high note: eating Scottish meat pies at The Eagle and Child in the exact room where C.S. Lewis, J.R.R. Tolkien, and the rest of the Inklings used to meet frequently to discuss what they were writing over drinks. And if the door in the back room marked “Narnia” hadn’t been locked, I would have had even more adventures to tell you about. The pub where the Inklings used to meet. Dinner in the Eagle and Child! Thursday was another busy and incredible day in London. We started out by going to the amazing St. Paul’s cathedral. Kara and I wandered around the building listening to guided audio tours that explained to us the art, architecture, and history of the Cathedral. Unfortunately, we did not get to look out over the city as the outside balcony was closed for construction. We did, however, go up to the interior dome and were able to whisper to each other from 30ft away due to the whispering gallery effect. Next up on our travels was the Tower of London which, funnily enough, isn’t a tower at all. It’s a full castle that is far more beautiful and elegant than its reputation would suggest. We went on a tour guided by a tower guard or “Beefeater” named Kevin. He explained to us a great deal about the prisoners and executions that occurred in the fortress and the many Kings and Queens who dwelled there over the years. The one thing he couldn’t tell us was why he was called a “Beefeater”. Apparently, despite many speculative theories, no one knows. We walked into the White Tower, and saw the ancient armoury with a vast assortment of gilded amours and beautifully preserved medieval swords and guns. Also housed in the Tower of London were the English Crown Jewels. They were magnificent. Gleaming and glittering with gold, gems, and precious metals. Topping the King’s sceptre was the star of Africa, Cullinan I: the largest diamond in the world weighing 530.2 carats. The total worth of the Crown jewels was somewhere around 5 billion USD. Wow. Yet, none of it compares with the glory of the Lord. Kara, Beth, and I then stopped over at Buckingham Palace to see the current home of the Queen and set off from there to Kara’s specially requested stop: the home of Charles Dickens. Inside Charles Dicken’s house, now a museum. The house had been turned into a Museum, and we all wandered the home seeing the way it would have looked while Dickens lived there. The most impressive thing, in my opinion, was Dickens’ personal writing desk upon which he wrote his famous works of Oliver Twist, A Tale of Two Cities, and A Christmas Carol. After a final full day in London we all slouched back to our apartment, ate as much food as we could so as not to leave any behind, and rested for our flight back to Scotland on Friday morning. Thank you all for praying for our safety during our travels! Our next big trip will be to southern Germany in the beginning of April so please pray for our contentment with the Lord’s will in that and in our continued studies here in Scotland. Day 5,110 of being a Christian. Day 3 of reading my Bible daily. I have never developed a consistent practice of reading my Bible…and I really don’t like to admit that to other Christians. It’s been a struggle of mine since I was a teenager. At least, that’s when I began to seriously try to get into the Word every day. When I attended a Christian camp in the summer, I would read my Bible daily during the time set aside for personal devotions, and then would continue with it once camp was over for…about four days. And once I missed that first day, I never got back into the schedule. For about five weeks now, Ethan and I have been reading and discussing in class with Pastor Quigley the book Spiritual Disciplines for the Christian Life by Donald S. Whitney. Not surprisingly, after the introductory chapter on what spiritual disciplines are and why they are necessary to the Christian life, the next two chapters are devoted to discussing the discipline of reading God’s Word. It was not a new lesson for me, but it was a convicting challenge that again forced me to ask myself if I really believe that reading God’s Word is important. One reason—well, excuse—that I have neglected to read my Bible diligently is that I’ve argued that I shouldn’t read it with a drudging attitude. I know I am not alone in this because the handful of Christians to whom I have admitted my Scriptural-deficiency have admitted to feeling the same way. But as I have been taught so many times before, discipline is never easy, and often not enjoyable, at the onset. Pastor Quigley spoke on Sunday of the “plod of the Christian life” and acknowledged that though at times it is downright boring, the glories of God’s promises are found through “the Biblical plodding in the doing of that which is right.” I have decided that it is not wrong to write “Read my Bible” on my to-do list for the day. In fact, it should be at the top of the list every day. Because, as 14 years of experience has shown me, I will never get into the habit of doing it unless I intentionally discipline myself to do so. I haven’t made a complete 180 since I’ve been here and overcome my failure of discipline. That’s actually been a part of my problem too long: thinking that after reading my Bible for four days or so I am disciplined and good to go. But a relationship with God—just as with anyone—requires diligence and commitment EVERY. SINGLE. DAY. I have, however, started a reading plan. It’s the Chronological Reading Plan through the Blue Letter Bible app and it gives me three or four chapters a day to read. I’ve also purchased a notebook and have been recording my thoughts throughout my reading, which has helped me to know what to pray about at the end of my reading. Yes, I have missed a few days, but having a plan is one of the things that has kept me from the recurring theme of quitting because I no longer have the excuse of not knowing what to read. Packer was quoted in the closing lines of chapter 3 in our spiritual disciplines book as saying, “If I were the devil, one of my first aims would be to stop folk from digging into the Bible… I should do all I could to surround it with the spiritual equivalent of pits, thorn hedges, and man traps, to frighten people off.” I believe that the ease with which I ignore God’s Word above many other things is a scheme of the devil, as well as a testimony to Scripture’s transformative power. And I also believe that one of the ways he keeps us from reading it is by allowing us to feel as if we are the only Christian in the world who struggles this way, which keeps us from asking others for help and accountability. So, I write this to you as a confession, a challenge, and a request: I am a Christian who does not read God’s Word diligently. If you find yourself in the same situation, will you strive to cultivate that discipline? And if you will, and if you already have, will you commit to helping other Christians do the same? 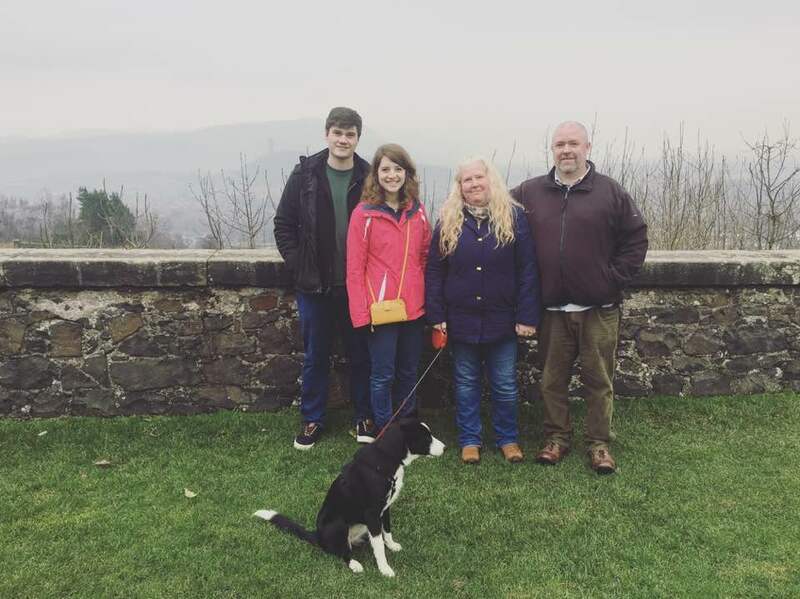 We went to Stirling Castle on Wednesday with Jimmy and Helen! The castle is surrounded on three sides by steep cliffs, making it very strong defensively. Here we are with Jimmy and Helen! Couldn’t ask for a better couple to spend time with each week and hear about Scotland. 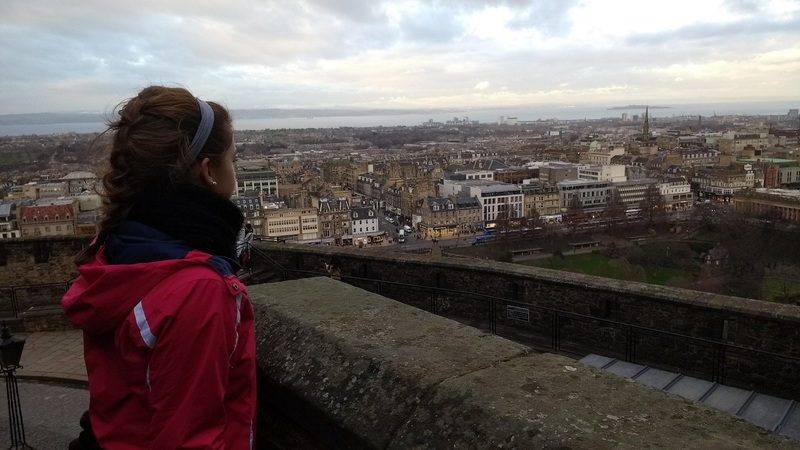 …which included visiting Edinburgh Castle! This is the oldest building in Edinburgh: St. Margaret’s chapel inside the castle. 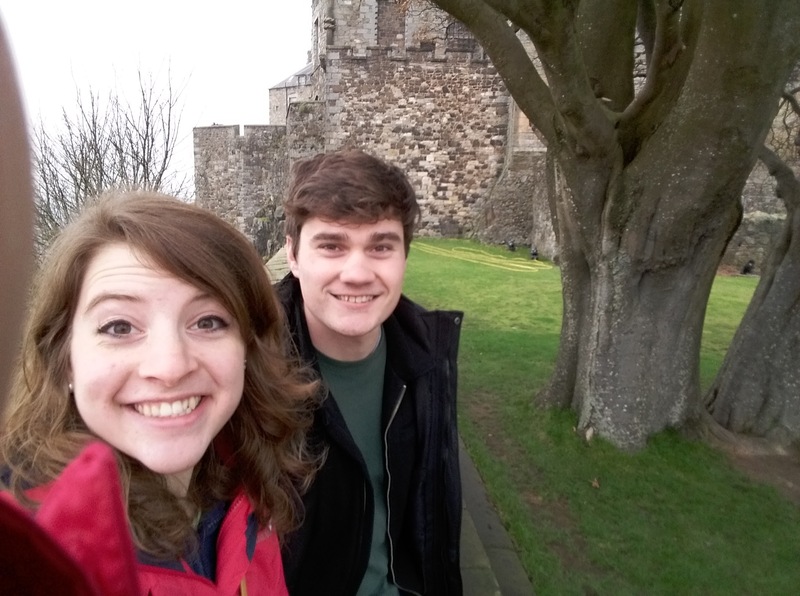 This week (6th-10th February) Kara and I went on our Reformation and Covenanter history tour and found ourselves standing amongst the very sites where the Covenanters achieved victory and freedom as well as sites at which they suffered crushing defeat. 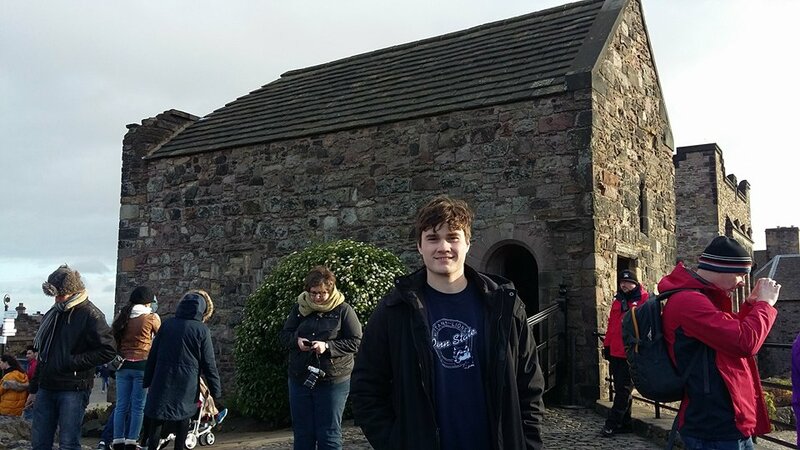 We traveled all over Scotland and saw many breathtaking places in the countryside and many harrowing memorials that made us contemplate the persecution suffered by the Covenanters. To write an exhaustive list of all the places we’ve been to this past week would be far too long an ordeal. However, it would be an insult to the memory of the Reformation’s martyrs to not regale you with a small fraction of their stories. These people suffered and died for the freedom to teach the truth of the Scriptures, and they must be remembered. Consider this your crash course on a handful of key events in the history of the Scottish Reformation. The first location to which Jimmy and Helen took Kara and I was St. Andrew’s Castle on the east coast of Scotland. Built around 1200 A.D., St. Andrew’s Castle was a key stronghold in the Scottish Reformation. In the early 1500s, the Roman Catholic church had become despicably corrupt by godless men who wished only for power and wealth and cared not for the lives and souls of God’s people. Both Archbishop Beaton and Cardinal Beaton used St. Andrew’s Castle as their residence and reigned over the Scottish people in an oppressive persecution of any who challenged Catholicism. Archbishop Beaton executed the first of the Scottish Reformers, Patrick Hamilton, and Cardinal Beaton executed George Wishart, Reformer and mentor of John Knox. Both of these Reformers did no crime but simply preached God’s Word to the Scottish people. The castle was attacked in 1547 by Reformers who were enraged by the unjust execution of not only Hamilton and Wishart but countless other supporters of the free teaching of God’s Word. The Reformers seized the castle, executed Cardinal Beaton, and established St. Andrew’s as their stronghold from which to defend the reforming faith in Scotland. John Knox was called by the rebel Reformers to be the minister in St. Andrew’s and after some deliberation he agreed. In the summer of 1547, the regent Mary I of Scotland (essentially the queen of Scotland as the real queen was too young to rule) commissioned French warships to besiege St. Andrew’s Castle. After months of siege warfare—in which tunnels were dug under the walls and the castle was shelled by French cannons on all sides—the Reformers were forced to surrender and were imprisoned on French ships, John Knox included. 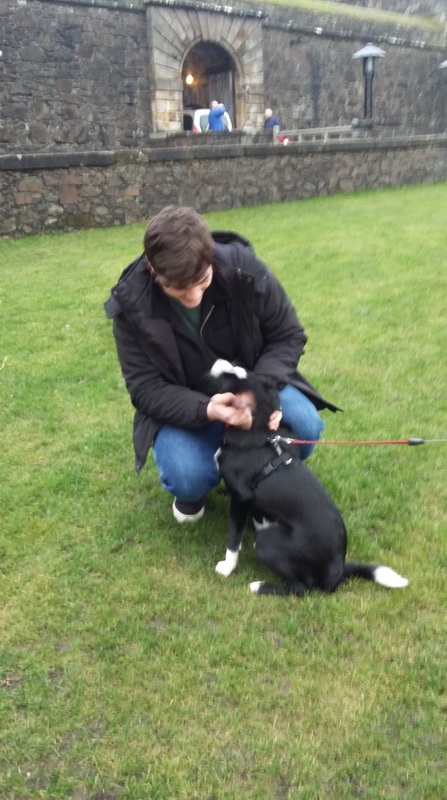 On Tuesday, Jimmy and Helen took Kara and I to see the famous battleground of Bothwell Bridge. It was at this site in 1679 that King Charles II of Scotland won a battle over the insurrection of men known as the Covenanters who refused to accept the king as the ruler over all the church. The Covenanters, a ragtag band of God-fearing men who had been prohibited from meeting for worship under pain of death by the king, were unable to defend themselves against the specially trained forces of the king. The king’s troops slew hundreds of the Covenanters and imprisoned over a thousand others who later died from the harsh conditions of their imprisonment. Lastly I will tell you the tragic story of the two Margarets. In 1685, during the reign of King James VII of Scotland, two sisters named Margaret (age 18) and Agnes (age 13) Wilson were arrested for attending a secret church service called a conventicle. The free preaching of the Word of God, having been outlawed by the decree of the king, was punishable by fines, imprisonment, or even death. The two sisters had been hiding in the home of an older woman named Margaret McLaughlin, who was arrested with them. They were falsely accused of fighting in the battle of Bothwell Bridge and sentenced to death. The girls, having been 11 and 7 at the time of the battle, had obviously not fought there, but truth and justice were irrelevant to the bloodthirsty King James VII. The girls’ father, upon hearing that they had been captured and sentenced to death, sold everything he owned in an attempt to buy his daughters’ freedom, but was told he only had enough money to free one daughter. Young Margaret pleaded with her heartbroken father to free Agnes rather than her. Agnes was freed and the two Margarets were taken out to the town of Wigtown, tied to stakes near the sea at low tide, and left to drown in the icy waters. The older Margaret drowned first, and the soldiers jeered to Margaret Wilson to beg for mercy. However, she stood firm and began to sing Psalm 25 to all who had gathered to watch in horror. A soldier, hearing her singing the Scriptures, waded out into the water and struck her with his musket. He forced her head underwater, silencing her praises and witness for Christ. I hope it is now as clear to you as it is to Kara and I that the Scottish Reformation was no small ordeal. Against vast opposition, simple Scotsmen defied the injustices of Episcopal kings and Catholic dogma for the sake of the truth. Thousands of men and women fought and died to preserve the truth of Scriptures in Scotland. Let us not forget their sacrifices and martyrdoms. Today while you are doing your morning devotions or praying before dinner, remember the Covenanters and thank God for those who died long before the establishment of America so that you might have the freedom to worship God and know the truth of Scriptures.